Some of our most popular Porsche decals. Including Carrera Stripes and Typeface Fonts. For our full range of decals, for all models, please see out specialist website porsche-decals.com. 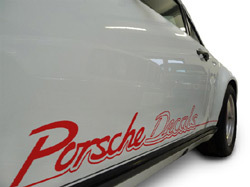 A comprehnisve range of Porsche Talbot Sport decals, originally available in 1980/1990s. 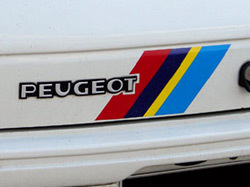 Perfect for restoring your Rallyes and other Peuegot Sport models. Decals and logos for many other makes and models. Customises decals by altering their size and colours. Browse our range of Make & Model specific decals. We specialise in Porsche decals and Peugeot decals, as well as offering a huge variety of decals for other makes & models. Select from a vast range of logos to create your own Door Stack Decals. Choose your colour, size and spacing. Create your own Bonnet & Viper Stripes. Select your width, length, spacing and colours.